Downtown Miami is receiving a new facelift as the 14 acre property where the Herald Building's is situated including an adjacant parking lot has been sold for $236 million to an all cash buyer, Genting Malyasis Berhad, a developer for resorts and casinos. 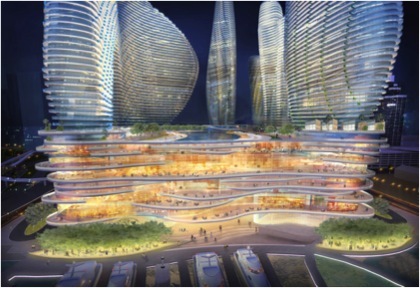 Genting Malyasis Berhad will be building Resorts World Miami. The designer for the project is Arquitectonica. The outstanding 10 million square foot project featuring its eye catching curaceous multi-tower design and fabulous LED lit exterior on the site which faces Biscayne Bay, hoping to turn this into a Las Vegas style hotel resort gambling entertainment area for tourists and the locals. Currently, the $3.8 billion dollar project se plans are now being scaled down. The five acre site where the Miami Herald currently sits will become the site for a five star luxury hotel, luxury condominiums, waterfront resstaurants, retail space and an 800 foot promenade streching along Biscayne Bay. The idea is quite inviting for downtown Miami! Resorts World will offer an adult style Disney World! This amazing Resort is next to the Adrienne Arsht Center for the Performing Arts. Miami World resort will anchor a three mile baywalk linking the Omni which may turn into another potential fabulous gambling resort with Museum Park, the American Airlines Area, Bayside Marketplace and Bayfront Park.